The idea sounds like something lifted from a Science Fiction movie set in the future, but how would you like your coffee delivered to you by drone? According to reports, tech megacorp IBM have developed a concept for a drone that is capable of dropping off a coffee by measuring certain facial, body and biometric data for when you need a caffeine (or decaffeinated) boost. So IBM are claiming that these drones will be able to predict when your caffeine levels fall below a certain point and remedy it with delivery from the air – much more than just delivering to order. Employees could no longer have the need to use up valuable company time waiting for the kettle to boil, and at least one barista less might be needed to serve customers in a coffee shop! 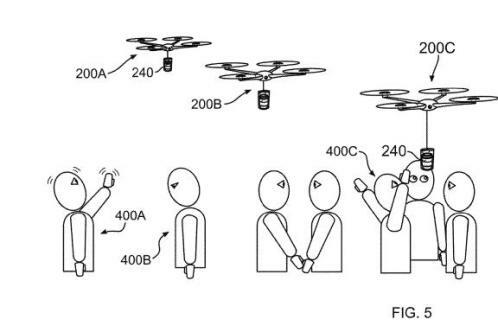 In addition to being handy in an office or cafe, maybe these drones could appear at a sporting event or rock concert, where a preordered cup of coffee could fly to you in time for the half-time break or where you could flag it down – if it were to catch your eye during in an instrumental ballad by your favourite performing artist. IBM’s slick drones would use facial or voice-recognition software, an electronic ID tag or Bluetooth from a person’s smartphone to ensure the coffee lands into the palms of the right person. Once your cup of coffee is flown-in, it can be lowered to you on an “unspooling string”. There are various ways to receive your hot beverages, however, according to the filed patent. In one instance, coffee would be dispensed from the drone directly into a cup. Another example delivers hot drinks in a sealed bag, thus preventing scalding. IBM was once a pioneering manufacturer of computer mainframes and desktop PCs for homes and businesses into the 1980s and 90s. More recently the company has moved into software development and artificial intelligence. If it seems colourful to think this drink-delivering-drone will one day rekindle the tech giant’s major share in the global technology space, it is indeed a fun story for all coffee lovers to consider. And you don’t feel that you have to wait and see if these drones do come on sale. We can help mobile coffee operations get up and running with machines capable of serving coffee in the most remote locations and unlike a drone, they don’t need a Bluetooth connection to find the customer.